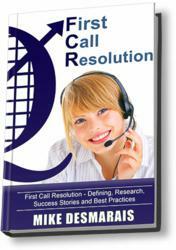 The purpose of the book, First Call Resolution, is to help call center managers improve their first call resolution (FCR) performance. The purpose of the book, First Call Resolution, is to help call center managers improve their first call resolution (FCR) performance. Since 1996, SQM has been the leading authority for measuring, benchmarking, tracking, consulting, awarding and improving call center FCR performance in North America. As a result of benchmarking over 450 call centers and surveying over 1 million customers and 25,000 CSRs on an annual basis, SQM has gained valuable insights into call center FCR performance and best practices for improving FCR. This book builds on SQM’s previous book, World Class Call Center, with an emphasis on FCR. This book focuses on defining, sharing research, client success stories and best practices for improving call center FCR. Mike Desmarais, is President and Founder of SQM Group Inc., is considered North America's leading authority on measuring, benchmarking and improving call center first call resolution performance. SQM Group has over 70% of their tracking clients improve their call center first call resolution performance year over year and they are very proud of this accomplishment.